Realme, the smartphone brand that specializes in providing high quality smartphones, launched its second device, Realme 2, in the capital today. Available exclusivel on Flipkart, Realme 2 becomes the first to offer a Notch Full Screen in the sub-10k segment. The phone marries the “Power meets Style” product philosophy, taking it ‘A Notch Above’ by offering a big and AI-powered 4,230mAh battery with 13+2 dual rear camera. Realme 2 will be available in 3 stylish colors, Diamond Black, Diamond Red and Diamond Blue in two versions: 3GB RAM+32GB ROM priced at INR 8,990 and 4GB RAM+64GB ROM priced at INR 10,990. The Diamond Black and Diamond Red will be exclusively available on Flipkart from September 4th, 12 noon onwards while the Diamond Blue will be available by early October this year. 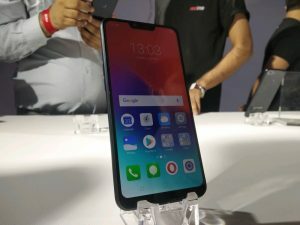 Realme has upped the ante by offering a 360-degree customer service system. The brand will be offering a new “Callme” Service, through which the service staff will reach at their doorsteps or preferred locations to collect the devices for repairing. Customers can also courier the devices to registered service centers free of cost. Meanwhile, Realme customers will also have access to almost 500 OPPO service centers across India with guaranteed 90% of repair cases resolved within an hour. Realme 2 features the second generation of the Diamond-cuttingDesign, featuring a more exquisite diamond appearance with more elaborate craftsmanship. It is made up of 12-layer nano–tech composite material which is also scratch-resistant. The versatile colours Diamond Black, Diamond Red and Diamond Blue will be a good fit to represent style and personality in a better way. 3. Smart Unlock: While your phone is at your frequently visited locations or connected with a credible device via Bluetooth, it could automatically unlock with your customized settings.